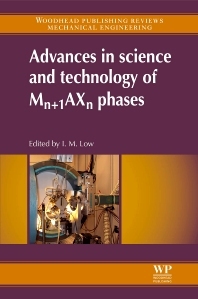 Advances in Science and Technology of Mn+1AXn Phases presents a comprehensive review of synthesis, microstructures, properties, ab-initio calculations and applications of Mn+1AXn phases and targets the continuing research of advanced materials and ceramics. An overview of the current status, future directions, challenges and opportunities of Mn+1AXn phases that exhibit some of the best attributes of metals and ceramics is included. Students of materials science and engineering at postgraduate level will value this book as a reference source at an international level for both teaching and research in materials science and engineering. In addition to students the principal audiences of this book are ceramic researchers, materials scientists and engineers, materials physicists and chemists. The book is also an invaluable reference for the professional materials and ceramics societies. Students of materials science and engineering at the postgraduate level; ceramic researchers, materials scientists and engineers, materials physicists and chemists. Professor I. M. Low is the current WA Branch President and Federal Secretary of the Australian Ceramic Society. Since 2008, he has served on the Editorial Board of the Journal of the Australian Society. He is the recipient of the prestigious 1996 Joint Australasian Ceramic Society/Ceramic Society of Japan Ceramic Award for ceramics research and edited five books, along with authoring over 200 archival research papers. He also currently serves as an OzReader for the Australian Research Council to assess Laureate Fellowships and Discovery Projects proposals.